Fotomoto | How do I install Fotomoto on Blogger? How do I install Fotomoto on Blogger? Important: please note that Fotomoto is not currently compatible with "dynamic view" templates. Go to the Settings page of the Fotomoto Dashboard, click the Get Script button and copy the Fotomoto Script. If you are using the old Blogger interface, click the Design link for your Blog in the Manage Blogs section of your Blogger Dashboard. If you're using the new Blogger interface, select Layout from the edit menu drop-down. Click the Add a Gadget link. This should bring up the Add a Gadget pop-up. Note the screen on the new interface looks slightly different than the below. Paste your Fotomoto script in to the Content field, then click the Save button. Google may redirect your visitors to a country-specific domain depending on which country they're in. This may cause a problem with Fotomoto since your site's domain must be listed as a Site Address in your Fotomoto Dashboard. 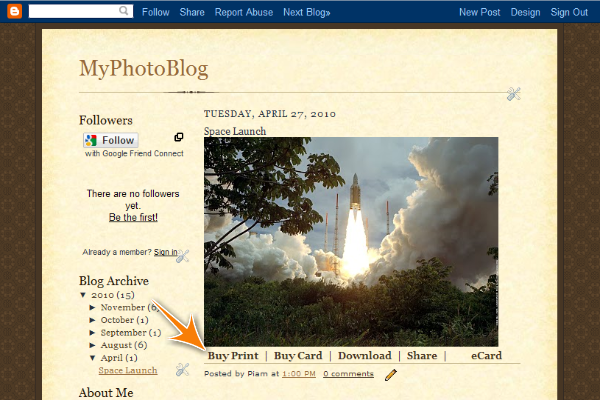 Your blog should now see the Fotomoto Buy Buttons under the images on your Blogger site. If you don't see the Buy Buttons, please see this article.